Experience a revitalizing stay at Seattle Airport Marriott. We streamline your travel routine by offering a complimentary shuttle to and from Seattle-Tacoma International Airport. Explore the local area, brimming with alluring attractions, such as Westfield Southcenter mall and the Museum of Flight. Afterwards, unwind from your adventure in our modern rooms and suites, outfitted with plush bedding, flat-panel TVs and free Wi-Fi for your ultimate convenience. Enjoy fresh seafood at our on-site restaurant, Aqua Terra, and a freshly brewed cup of coffee at Consummate Grind cafe. For active travelers, partake in an invigorating workout at our 24-hour fitness center. Need to host an event? Reserve one of our 14 versatile event spaces for your next business meeting or wedding reception. We also feature an outdoor atrium, which provides a gorgeous backdrop for intimate gatherings. 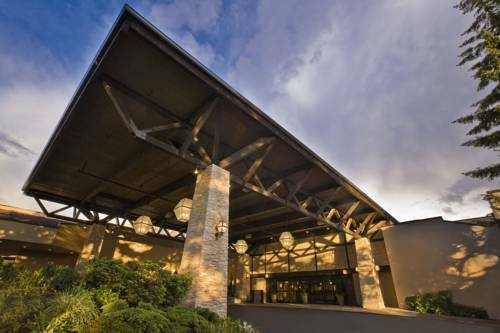 Whether you're embarking on a vacation getaway or corporate travels, settle into relaxation at Seattle Airport Marriott. Aqua Terra: Get a taste of local, farm-to-table cuisine at our restaurant, positioned near the Sea-Tac airport. We serve an array of seafood such as crab chowder, salmon fillet and pot of clams. Select an elegant glass of wine or cocktails from our drinks menu. Consummate Grind: Whenever you're in need of a caffeine fix, enjoy a freshly brewed cup of Starbucks coffee at our caf . We also serve a selection of teas, fresh fruit and pastries.